Photo credit: Aleph Objects, Inc. 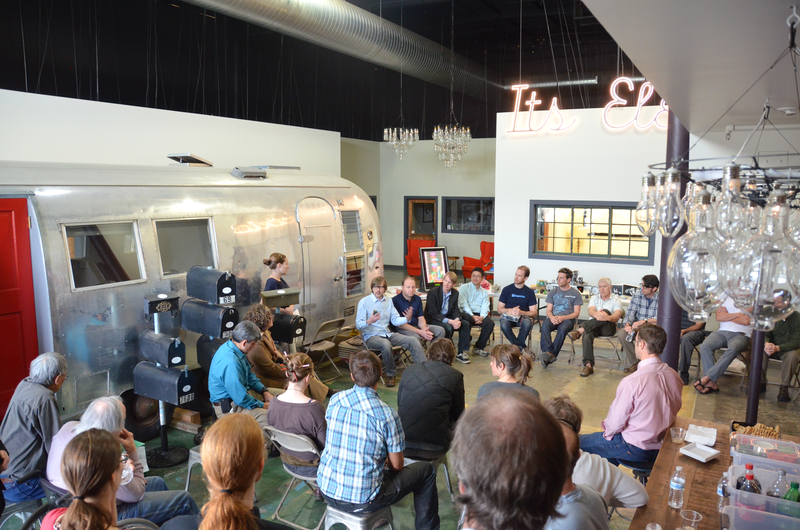 The Front Range Open Source Hardware Symposium was a success! The purpose of the event was to educate the public about open source hardware. Ten open source companies (Sparkfun, Lulzbot, Open Tech Collaborative, Road Narrows Robotics, Modrobotics with their open manufacturing system, Great Scott Gadgets, Cryptotronix, Pcduino, Sparky’s Widgets, and representation from Mach 30) were present along with around 50 attendees. We had an excellent discussion with House of Representatives Congressman Jared Polis. The main topic brought to the attention of Congressman Polis was that innovation moves faster with open source hardware which is why it is important as in IP alternative. Many people also voiced the need for more openness in publicly funded research to enhance the copy-ability of experiments and use open source hardware alternatives within the education system for the benefit of transparency and longevity. There was also mention of the inhibiting cost that some governmental regulations can have on open source hardware. And Jared Polis voiced his concern about making sure open source hardware stays accessible and open in the face of new IP reform. You don’t take our word for the success of the event, Here’s a write up from Aaron Harper. We wanted to share the process for inviting a member of Congress / government official to speak with the open hardware community where you live. While OSHWA can not currently help with funding these events, we can assist by sharing fliers, email copy and the information that it takes to host an event. 1. Contact your representative to ask if they would be willing to participate in an event talking with the open source hardware community. Schedule a time (be prepared to wait a few months for a time slot). Check with their office that the signage for your event is appropriate and notify them of the location. 2. Set up a way to RSVP (we used Eventbrite), and promote the event. The event should be a public event to educate the public about open source hardware. OSHWA can include your Open Hardware Symposium with your congressperson on our events page and mailing list. 3. Communicate with the people involved, those asking to show their open source hardware projects and your congressperson (or their staffers). Here is a copy of the logistics email sent and the agenda email.